Hong Kong Style restaurants are thriving every where around Malaysia recently and it has become a fad to dine in one too. But have you come across one that truly deserves your thumbs up? I’ve been to many of the outlets before. You name it, the first ever restaurant, Kim Gary, Mongkok Char Chan Teng and many more that I can’t remember. Most of the time, the food just taste bland. If not, then its because it just doesn’t taste right. Or at least, it doesn’t deserve any of my recommendation to others. However, I’ve come across U-Village as one Hong Kong Style Restaurant that truly gives you a taste that you will never forget! Perhaps its because (as I was told) the owner of this modest outlet is a Hongkie himself. For starters, you can try ordering their extraordinary french toast. 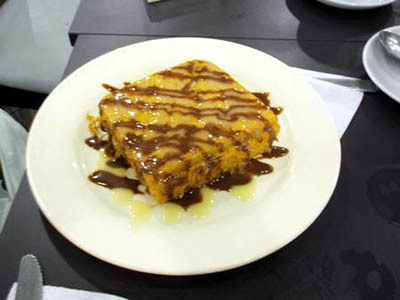 Usually, the french toast I taste in other “Char Chan Teng’s” are either too sweet or too dry because of the peanut butter and honey mixed together. However, you should definately try this french toast. Inside it, they added banana and served with condensed milk as decoration to add to the taste. Not too sweet for me but for the banana lovers out there, its a must! TGI Friday named after almost everyone’s favourite day, this is the place to be if you want to celebrate the beginning of a great weekend! I believe most people have been to this place before but nevertheless, I want to introduce some of the great desserts and drinks that go along side with the main course. For those that have yet tried this western cuisine, this is a must option if you want to experience the friendliness of the staffs there and an atmosphere of relaxation. Known for a great place to celebrate birthdays (because they come along with a session where the staffs there sing for you a birthday song), it is also the place to be if you want to just hang out with your friends. The background is pumped up with the latest beats from the top 20s. Some of the drinks that is a must try would be the summer cyclist. Aixture of fresh strawberries and oranges blended together with ice, the name says it all. Refreshingly sweet, the drink balances between the sournessand the taste of both the fruits. This interesting blend is currently priced at RM7.90 per glass. If you love steambot, you’ve got to love it the porridge style. The concept of cooking all the ingrediants that a traditional steambot has is that porridge is actually a better at keeping heat compared to soup due to the thickness of the porridge. At the end, you can only taste the sweetness of the ingrediants that is kept in the porridge. You are currently browsing the Yummy Corner weblog archives for June, 2006.